Mactan remains a popular dive destination despite massive coral reef destruction. Human activities impact, i.e. dynamite and cyanide fishing, coral harvesting, gleaning, boat hull and push stick (tukon), pollution from Mactan Channel, scuba and hookah spearfishing, and Koreans have reduced the Mactan reefs to a tiny fraction of what they were decades ago. This has greatly diminished the drawing power of Mactan reefs among underwater tourists. Immune to all these is the attraction of Mactan’s sea caves.There are a few: Caubian cave, Caubian Blue Hole cave, Tingo cave, San Vicente Twin Caves, EmDong cave, and other minor caves or “swim through’s”. The most popular by far is Marigondon Cave due to its grandeur and accessibility. All share the common property of having the floor at approximately 30 meters. 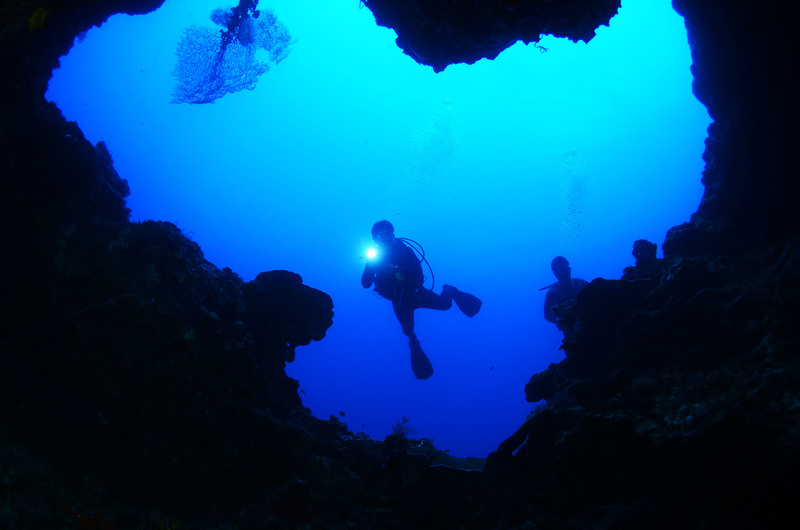 How are these sea caves formed: Whereas filipinocavediver Jake Miranda (see previous article) refer to fresh water caves as dissolution caves (root word: dissolve), the sea caves are attrition caves. In the last ice age more than 20,000 years ago, much of earth’s water was frozen in the massive ice caps. The sea level in the Phlippine Islands was at the current depth of approximately 30 meters. 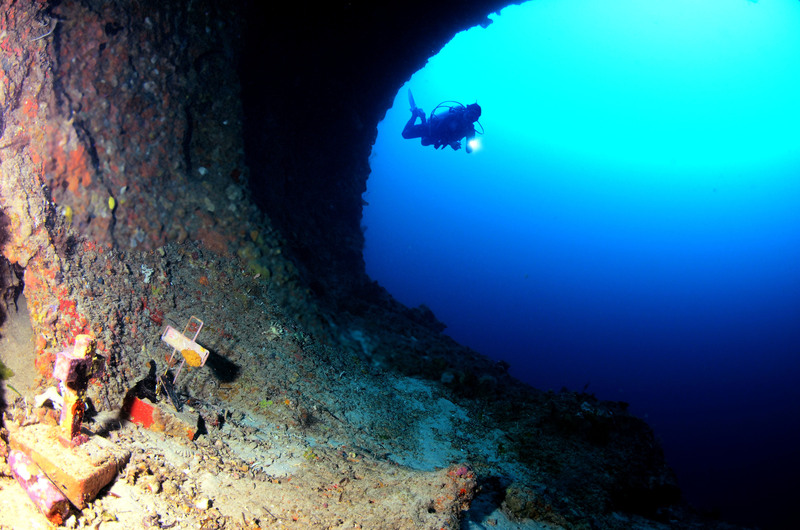 The famous walls of Mactan Island diving were above-the-water cliffs. Thousands of years of constant pounding from the waves created cavities in the weak spots of the limestone cliffs creating the caves by attrition. Such is the way the Marigondon and other sea caves were formed. These caves typically has maximum penetrations of about 50 meters owing to the dissipation of the wave force as it penetrates farther and farther into the formed cavity. At the end of the last ice age some 20,000 years ago, much of the ice caps melted, raising the sea level worldwide. In the Philippines, it rose by approximately 30 meters, the current sea level. Most of these caves have sandy floors that slopes down for a distance which I refer to as “secondary beach”. In the bliss and rapture of nitrogen narcosis while diving deep past the walls, I envision myself among prehistoric islanders having a camp fire on the beach. A self-portrait of the author entering the famous Marigondon Cave. The “grave sites” to the left bottom are memorials from foreigners who passed away in their respective countries and have their ashes immortalized in their favorite dive site. There are 2 or 3 others in various areas of the cave.